Merle Maple Sweet Maple Mustard is made with pure maple syrup, cider vinegar, dry mustard, salt, and garlic powder. The maple undertones give a delicate twist to the classic mustard condiment. 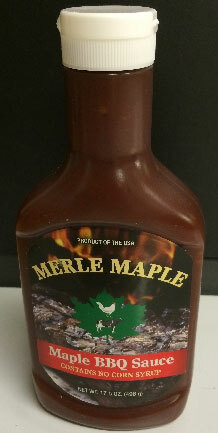 Merle Maple Hot Maple Mustard is made with pure maple syrup, cider vinegar, dry mustard, salt, and garlic powder. The cider vinegar adds a kick to the classic mustard not heat. Merle Maple Apple Butter is made of a sweet blend of apples, pure maple syrup, and spices. This is a perfect topping on pancakes, waffles, toast, and pretzels. Merle Maple Sweet Pepper Jelly is made with sugar, pure maple sugar, sweet and hot peppers, white vinegar, carrageen, and salt. This jelly goes great on toast, in sandwiches or on crackers. 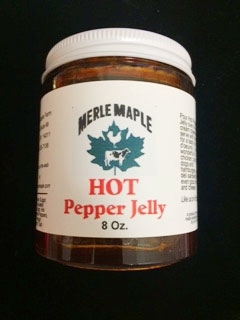 Merle Maple Hot Pepper Jelly is made from sugar, maple sugar, hot and sweet peppers, white vinegar, carrageen, and salt. This jelly is perfect for making hors d'oeuvres, as a relish on hotdogs and hamburgers, or on a sandwich. Grade A Dark Syrup has a robust flavor that comes from sap that has been collected towards the end of the season when the days are longer and warmer. The lower sugar content in the sap produces syrup that is less sweet and has a darker color bringing out the maple flavor. This versatile grade is perfect not only as a topping but for glazes, cooking, and baking. 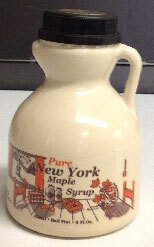 Maple Syrup set of (4) 3.4 fl oz plastic jugs. Try each grade of maple syrup! 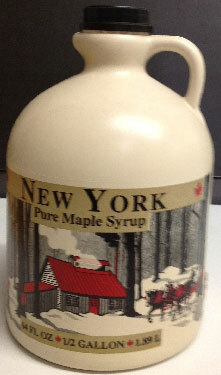 Grade A Golden Maple Syrup comes from sap produced at the very beginning of the maple season. This is a very sweet syrup with a delicate maple flavor with a light color. 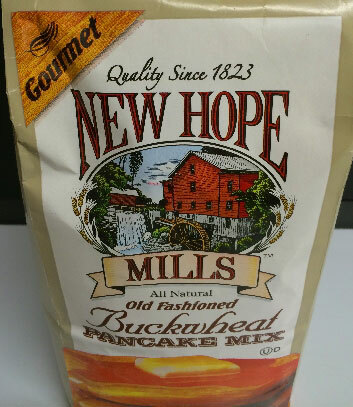 Perfect for pancakes, candies, and making maple cream. 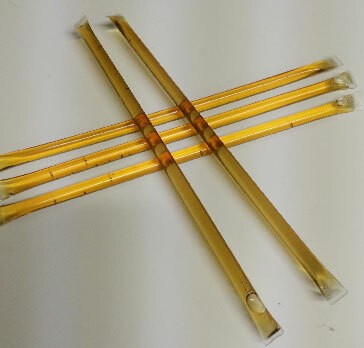 Grade A Amber Maple Syrup comes from sap produced in the middle of the maple season when the temperatures are a bit warmer. 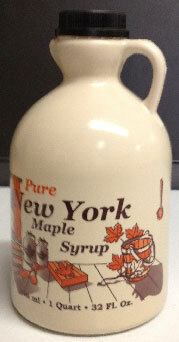 This syrup has a rich maple flavor and is the most common grade used on pancakes and waffles. Grade A Dark Maple Syrup has a robust flavor that comes from sap that has been collected towards the end of the season when the days are longer and warmer. The lower sugar content in the sap produces syrup that is less sweet and has a darker color bringing out the maple flavor. This versatile grade is perfect not only as a topping but for glazes, cooking, and baking. 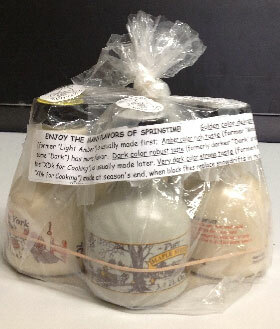 Grade A Very Dark Maple Syrup has a strong flavor and is best used as a cooking ingredient or for baking. 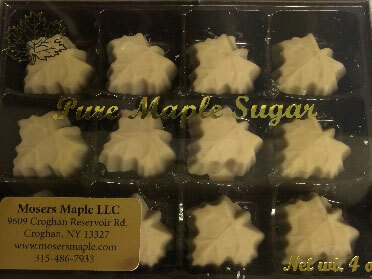 Maple Sugar Cakes are a melt-in-your-mouth candy made from Pure NY Maple Syrup with a fudge like texture. 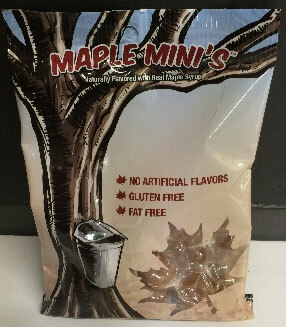 Maple Minis are a naturally flavored hard candy made with real maple syrup. They contain no artificial flavors and are a gluten free, fat free treat! 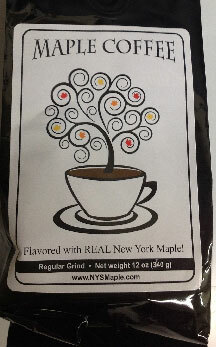 Maple Sticks are an all natural nutritious snack made from Pure NY Maple Syrup. Simply break open the end and enjoy a sweet treat! 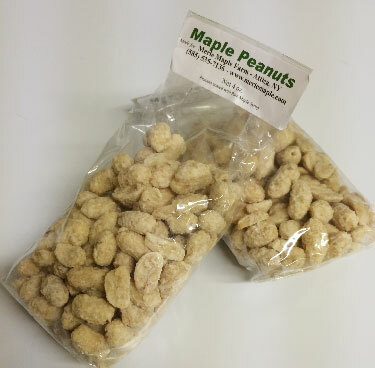 Peanuts coated with Pure Maple Syrup are a sweet, salty, and crunchy treat. Maple Hot Sauce is made from Pure Maple Syrup with a mix of ground hot peppers, vinegar, anchovies and other spices for a sweet yet hot kick to any dish! Maple BBQ Sauce is made from Pure Maple Syrup, anchovies, vinegar, hickory smoke and other spices for a sweet yet smokey flavor. 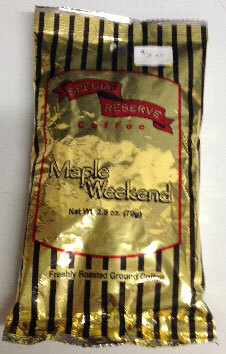 Maple Coffee is made with ground Arabica beans and flavored with Pure Maple Syrup for a rich aroma and sweet taste. Maple Weekend Coffee is made with freshly roasted ground coffee with maple syrup flavoring for a rich aroma with a sweet taste. Maple Herbal Tea contains Natural Flavoring, Chamomile, Rooibos Tea, Sunflower petals, Calendula Flowers, and Maple Sugar. 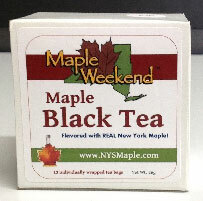 Maple Black Tea box contains 13 individually wrapped tea bags. Maple Black Tea contains Black tea blend, natural flavoring, chamomile, sunflower petals, calendula flowers, and Maple sugar.